Here�s the material you�ll need for this project: Various colors of ordinary household thread, sharp scissors, paper masking tape, double-stick Scotch tape and tweezers. 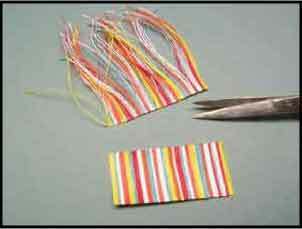 First, you�ll need to cut the thread to length. 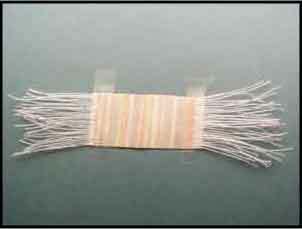 Thread is cheap�cut the pieces longer than you need so they�ll be easier to work with. 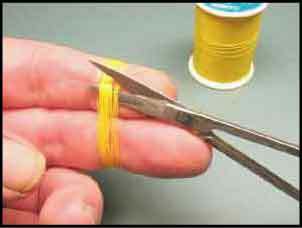 Wrap the thread around your fingers and cut as shown. Need longer pieces? Use more fingers. Next, attach a piece of masking tape to your work surface. The large piece of tape is positioned sticky-side-up and anchored at each end with smaller pieces of masking tape. The tape is sticky-side-up so we can attach the thread. 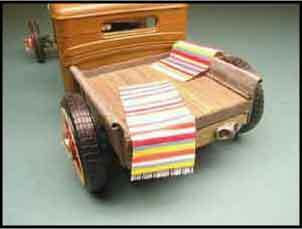 Use a larger piece of tape than you�ll need�the rug finished rug will be trimmed later. 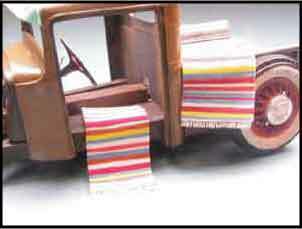 Draw a few pencil guidelines on the tape you�re the thread will remain straight for the length of the rug. 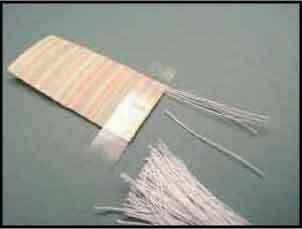 Lay the first piece of thread onto the tape and pat it down so it sticks and won�t shift. If the first piece is nice and straight, the rest will fall into place fairly easily. This is where the longer thread length comes in handy and makes the pieces much easier to handle. Add additional thread one piece at a time, making sure that each new piece is tight against the last. You�re working on the length of the rug at this stage. Stop when you�re rug is as long as you want it. When you�re finished, it should look like this. The extra thread hangs off the sides of the rug. It sounds tedious and time consuming, and it is�..but the results are worth it. 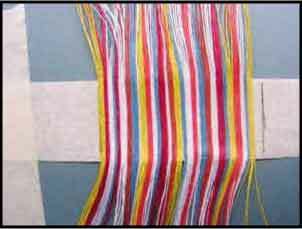 Next, pull off the end pieces of tape and trim the blanket too the width you need.. It�s easier to get a sharp edge if you trim into the tape. 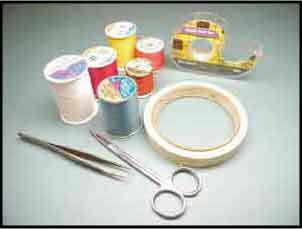 Don�t just cut off the loose ends of thread. The blanket isn�t complete until we add the fringe on the ends. That�s where the double-sided Scotch tape comes into play. 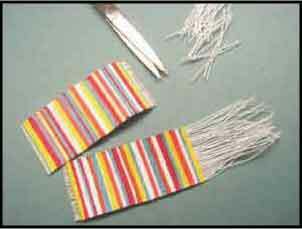 Turn the rug face-down and lay a small piece of double-sided tape across each end. Make the tape longer so it also holds the rug to the work surface. 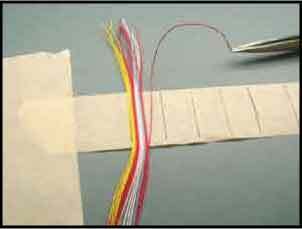 Press small pieces of white thread onto the tape as shown. Leave more space between pieces than you did on the construction of the rug itself. When you�re done, carefuly trim the fringe to length. That�s it! The finished blanket can now be folded to fit your particular application.